The Alley Way Stamps: March Sneak Peek Day 3 - Wigwam: WIN IT and the Coffee Lover's Blog Hop! March Sneak Peek Day 3 - Wigwam: WIN IT and the Coffee Lover's Blog Hop! It's time for Day Number THREE of our March Sneak peeks! Squee! Tomorrow we have our New Release Hop where we will give away ALL THREE to one lucky stamper! What?! Yes! You read that right! ALL THREE NEW SETS will be given away to one lucky person tomorrow! Click on the Rafflecopter widget below to enter to win this set - Wigwam !!! ! You have until 7 pm TAWS time tonight to get your entries in! For our friends that do not have Social Media accounts, you can also just comment below. We will randomly pick commenters for our giveaways, too! This contest will run TODAY only (2/27/14), but we will have giveaways for the next few days! We are also thrilled to be sponsoring the Spring Coffee Lover's Blog Hop! We will be giving away the Tea Par-Tea set to one lucky winner! • Permalinkies for Super Sponsors & FLASH Sponsors have been preloaded into the inlinkz for the hop! I’ve used company logos for the thumbnails. • Super Sponsor prizes will be picked via random.org based on the hop inlinkz. I will draw the winners and I will route the winner’s contact information to each sponsor. • FLASH Sponsor prizes will be picked via random.org based on the hop inlinkz. I will draw the winners and I will route the winner contact information to each sponsor. These will be drawn/posted during the week of the hop. It's all about having fun and sharing our mutual passions of paper crafting, coffee, tea &/or the love of cocoa! Head on over to the blog for full details!!! Hi there! It's Tracy here with some Tea Par-Tea inspiration for you! I created the gorgeous background with Distress Inks and added the sentiment from the More Than Words set. Hi all, it’s Francine! 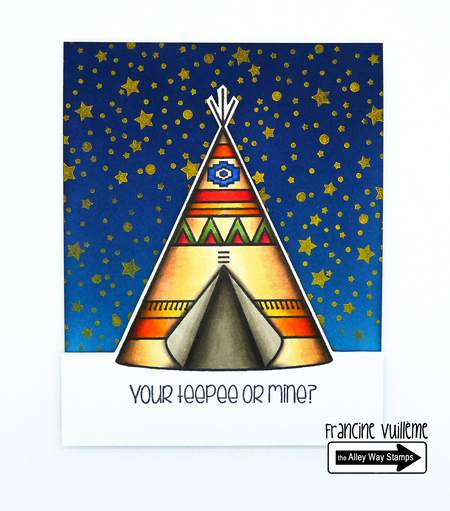 Today, I want to show you my peek day card using the new Wigwam set. I colored the tepee with Copic markers and used the Stars of the show for the starry sky. Hello, Emily here with a sneak peek of March release. This is image is from the set called Wigwam. I had lots of fun colored this tepee with Copic markers. Hope you like it! Greetings Friends!! Meredith here bringing you my version of the adorable new set Wigwam! Happy Friday everyone.. Holly here with an Alley way Flashback and a project for the Coffee Lovers Spring Blog hop! I'm using the fun set Breakfast Club for project. Hi! 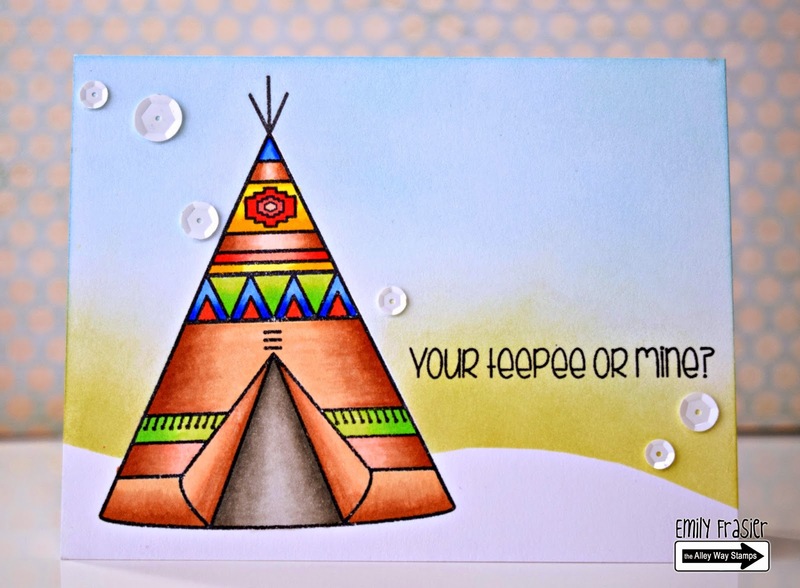 Marina here, sharing with you Sneak Peek Day 3 card using the new Wigwam set! Wow another awesome post over here love, love it. So much inspiration by the team again and looks like another great set. These are sooo CUTE and SWEET! Love! Love these projects, such cool images!!! Beautiful cards...love the Native American theme. Stunningly gorgeous cards!! I really love the stenciled background on the first card! Fabulous cards and thanks for being a sponsor!! can;t wait to see the full reveal! BEautiful cards, definitely I enjoy my coffee cup whit this beautiful cards! Adorable cards, each one so unique. And love the Tea Par-tea Set adorable. Thank you for being a sponsor. Wow - one more beautiful than the next! Wow, I love the teepee! Great cards! Thanks for sponsoring the Coffee Lovers Blog Hop! Gorgeous cards- love the first one with graduated colour! Great cards for the wigwam set and the coffee lover's blog hop. I like how the wigwams are colored. great cards. I really liked the dreamcatcher design! And your tea set is really cute. What a fun set. I loVe all the different techniques and colors everyone used. Beautiful cards everyone. Thanks for sharing. Love the cool set and the dreamcatcher looks so awesome!! Yea for the chance to win it!!! what fabulous cards!! love that set! it's adorable! thanks so much for being a sponsor! Such pretty cards. Love the vibrant colors. Thanks for being a sponsor. I LOVE this adorable coffee stamp set! Really fresh design! Wow! Fabulous cards ladies! Cool idea! Thanks so much for being a sponsor! Love your stamps! Beautiful cards, I love the wigwam! Love this set! Such fun inspiration! Love all the sets they are amazing!! Fabulous cards andanother cute stamp set. Beautiful cards Ladies, enjoying the inspiration today! Thanks for being a sponsor of the blog hop! Enjoy your Friday! You had me at wigwam!!!! aww those cups are too adorable! lots of ways to color them! I love dream catcher, sooo beautiful.. Awesome sets! Love the cards! A very interesting set. Unusually clever! What a fabulous tea set...just so sweet. I LOVE your cards and stamp sets! Such wonderful card creations! thanks for sponsoring with the hop! Oh shoot, I missed my chance to try and win that wigwam set and this native american needs it! lol. Love the DT fabulous creations. Thanks for the chance to win the coffee lovers prize. What a bunch of beautiful cards!! And what a fabulous new set. Wow! This a gorgeous collection of cards! Let's have a tea party. Wonderful creations. Oh mah gosh! These are just fabulous! I am drooling over them all! 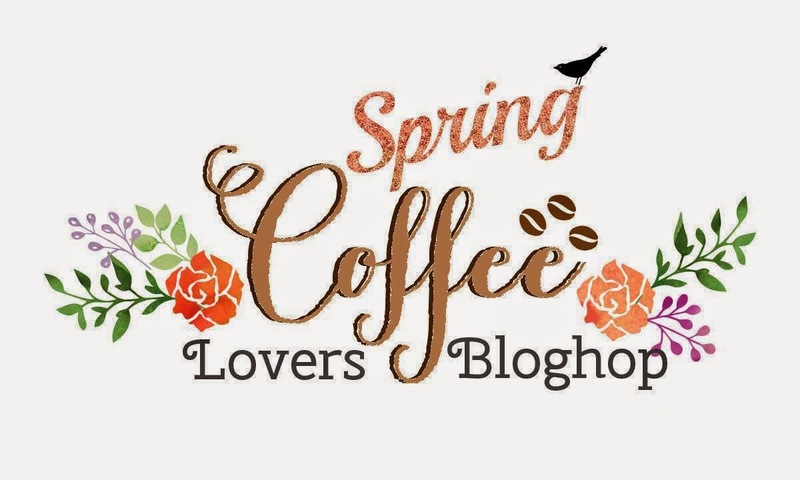 Thank you so much for being a sponsor of the Coffee Lover's Spring Blog Hop and creating such wonderful ispiration for others to get creating! FAB projects! Thx for sponsoring the hop! Great stamping, coloring and layouts. I especially like the Teepee cards. Adorable cards! Thank you for sponsoring the hop! These are all such great creations! Thank you for being a super sponsor and helping to make this blog so much fun for the rest of us. Absolutely adorable!!! These are all fabulous inspiration! great creations for your DT! Gorgeous cards! thanks for sponsoring the hop. Great projects,so beautiful and awesome.Thanks for your inspiration. Fabulous creations with beautiful stamps! Thanks for the chance to win! Fabulous creations, ladies! WOW! Thanks for being a sponsor! This is a unique themed stamp set. How awesome. Love the cards by the team. Oooo, I see some must have sets to add to my collection, thank you for sponsoring! My goodness, these are all amazing! Thanks for sponsoring! Thanks so much for sponsoring the Coffee Lovers Hop. That's a fabulous stamp set!!! These cards are breath taking! Such talented DT! Thanks for sponsoring the blog hop! A host of really lovely cards! Beautiful new stamp sets. I love the tea set. Great cards! !